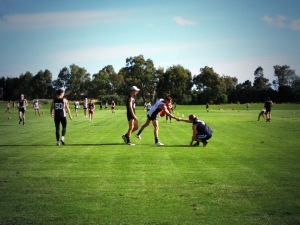 Thirteen of the VWFL’s top players have been selected to take part in the 2014 AFL Victoria VWFL Academy/ TAC Club Talented Player Pathway Program – a special pre-season training programme, focussing on skills and game sense, held at their local TAC Cup region. The VWFL stated on their website they were delighted to have the Northern Knights, Calder Cannons and Eastern Ranges on board for training program but added all TAC Regions were supportive of the idea. AFL Victoria’s VWFL Competition Manager Darren Flanigan said it was a great opportunity for the girls to further their football development. Players are expected to attend weekly training sessions. The first session with the Calder Cannons and the Northern Nights took place last week.